Taking part in our food and drink tours is a great way to see the West End of Glasgow. The leafy West End is home to many of Glasgow’s iconic attractions, some of Glasgow’s best restaurants and beautiful green spaces, it is a must to visit Glasgow. 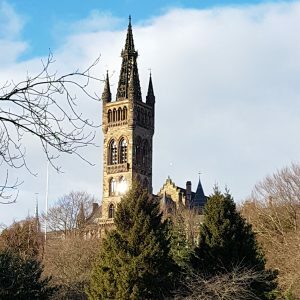 The stunning buildings of the University of Glasgow and Kelvingrove Art Gallery & Museum are places to visit.. Their beautiful Gothic revival and Victorian architecture shows how amazing Glasgow buildings are. The Riverside Museum, known to me as the transport museum is a ‘must visit’. Designed by Zaha Hadid, it was named European museum of the year in 2013. There are many areas in the west end where you will find great restaurants, bars and shops you need to go to. From Finnieston to Ashton Lane all our 6 venues we visit are different. The Park Bar for Scottish gin to Innis and Gunn for craft beer, The Butchershop for amazing steak to Mellis Cheese mongers for a wide array of Scottish cheeses. Finnieston was named ‘the hippest place in the UK 2016’ by the Times. It’s a great area to find independent eateries and bars in Glasgow. Ashton Lane is a lovely cobbled back street off Byres Road where you can chill and enjoy a drink on a warm summers day. Kelvingrove Park and Botanic Gardens are places you visit when it’s Taps aff weather (warm & sunny). We wander through Kelvingrove park on the tour. The Stewart Memorial Fountain is a lovely feature in the park and it was built to commemorate Robert Stewart. He was the man deemed responsible for bringing Glasgow’s fresh water supply from Loch Katrine. Glasgow still gets its fresh water supply from the Trossachs. Kelvingrove has featured in many films and programmes like Outlander and Stone of Destiny. It’s also a great place to take the kids and the dog for a walk. So come join us on one of our Glasgow tours and see it through a local eyes. Glasgow & the West End have so much to offer! Things to do in Glasgow – A Glasgow Food Tour?